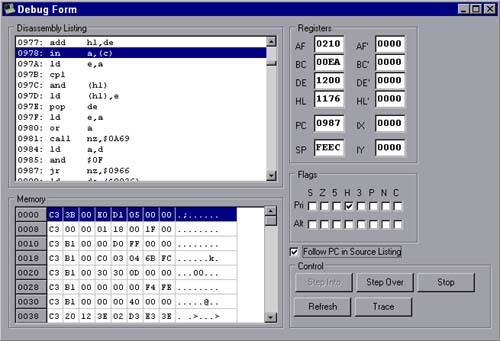 This page provides some introductory technical specifications about the MZ80B machine, and also showcases the MZ80B emulator produced by me. Capacity for 2 Graphics Boards giving 2 independent mono 320×200 planes. Integral Cassette Tape. Software controlled transport system. 1800 bits/sec using Sharp PWM. The MZ-80B was originally designed as a modular system. Some of the planned expansion modules were subsequently manufactured and sold, others, sadly, were not. This card clips beneath the CRT housing and connects to the motherboard using 2 ribbon-style cables with IDC Connectors. This card is inserted into the MZ-80EU Expansion Unit, and coupled to the MZ-80GM 1st Graphics card using a ribbon-style cable. This module holds up to 6 expansion cards, and is inserted in the cavity at the rear of the machine. It is connected to the PSU and Motherboard of the main machine. A MUST in order to add expansion cards. This card claims to offer a bi-directional interface to the computer. It was intended primarily for use as an RS-232 interface. Inserts into the MZ-80EU Expansion Unit. 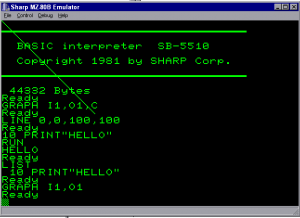 This card inserts into the MZ-80EU Expansion Unit and provides an interface for a centronics-style printer. Various printers were available (80-Col and 132-Col), and were based around EPSON Engines. 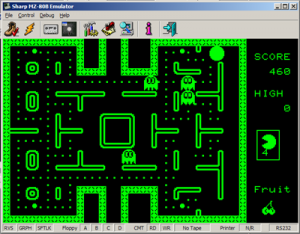 Additional ROM sets were available to adapt existing Epson printers to print the Sharp character set. This card inserts into the MZ-80EU Expansion Unit, and allows connection of the MZ-80FD/FB/FBK Floppy Drive Units. Based around a Ferranti MB-8866 FDC I/C. This external dual-floppy drive unit was suitable for connection to the MZ-80FI interface, and provided 2 drives each with 286K of storage capacity. Geometry of the disks was: 70 tracks (35 double-sided), 16 sectors, 256-Bytes per Sector. Other devices planned included a Hard Disk interface, Punched Card Reader, Color Display, IEEE-Compatible interface. Unfortunately, details of these are scarce, and I have not been able to find out whether they were ever produced (either in prototype or commercially). Tip #1 – Where there’s smoke, there’s fire? Well, not exactly! I experienced a Power Supply failure with both the Computer and Floppy Drive. When connected to the mains, they produced lots of smoke. This was caused by faulty smoothing capacitors across the supply connector. These capacitors are not required with today’s high-quality domestic power distribution, and can be safely removed, eliminating the smoke problem. I have performed this mod myself, and it works OK for me, however I accept no liability for damage caused by performing this. Remember: Always disconnect the power supply before opening a piece of equipment, and if you are not sure what you are doing, always consult the aid of a qualified electrical engineer. After several incarnations (MS-DOS, Linux X11), finally the Windows version was completed. This is the most complete of any of the versions of my MZ80B Emulator (and in fact the only one I still have source code for!). 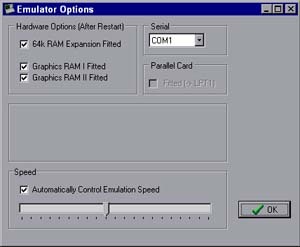 The emulator features a limited set of options, allowing for automatic emulated speed adjustment, and the ability to enable/disable the graphics memory expansion, RAM expansion and to insert/eject virtual floppy images. Oooo, cheers for the pack of floppy images. The discmgr.exe needs a dll named BORLNDMM.DLL – do you still have this one ? The dlls can simply be placed in the same directory as the exe in order to work – no need to put them in system folder or anything like that. 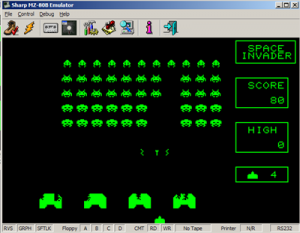 Got some of my old MZ-80B disks to life again, thanks to CPDREAD and your remarkable emulator – best of the three, I know. Only, I (other users do not???) desperately miss something like a print-to-file function. Thanks in advance, perhaps you know other users success in coding that? This is also true when running here under Windows 7 .. The main problem is I’m not able to rebuild the source easily any more, so I’m in the process of rewriting/reworking the emulator, but it’s a slow process due to limited available time. It’s coming along, but not usable yet (mainly as I’m working on the disc support currently) I’ll post when I have more info though! 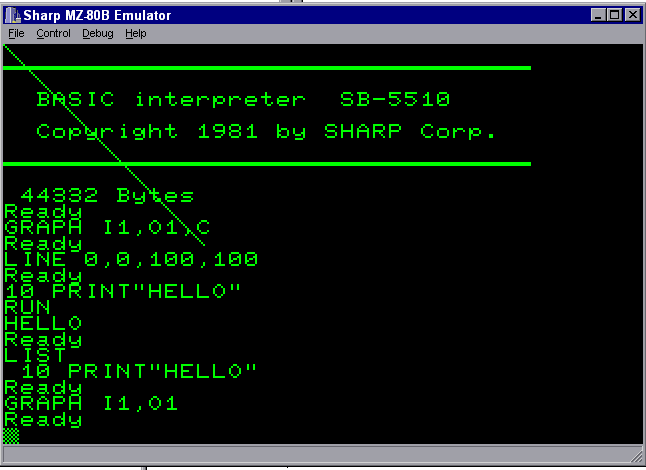 Hi, glad you like the emulator – been a long while since I worked on this!! Thx for replying so soon – unfortunately I’m not ready for all answers today. 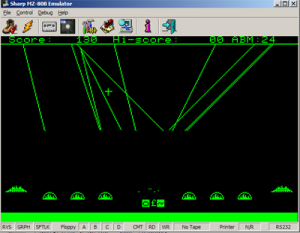 Repaired some faults on my MZ-80B recently (PCB capacitors blown, horizontally squeezed Screen…) and have to do a cassette player mending and the PCB repairs to printer (P5) and dual floppy the other days – so: no live MZ80-B screen shots for you to see what’s for yet. Please await my e-mail for first answers, screen shots of VM etc. until Sunday evening. 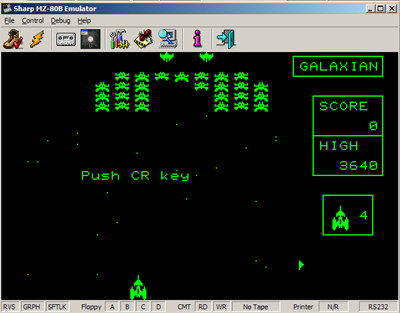 Just a question to your screenshots about some games like Galaxian, Space Invaders or Arkanoid. Are these games included in the SharpDisks archive? If yes, which disk and how I can load the games? Sorry, for my my newbie questions. It should be included, yes – Try DISK15.DSK ? I still have my mz80b (sitting on a shelf behind me as I type) and was amazed to see a virtually fully functional emulation of it available here. On the Linux/X11 front I can run the Windows binaries and DLLs using Wine on 64 bit FC17. Everything seems to work fine, though there are some interesting keyboard mappings. Z and Y are reversed, and most of the symbols seem to be dotted about the keyboard. It looks like this is mapped pretty much to the original layout, but for a European keyboard (which is fair enough). Is this correct, if so, is there any way can I tweak it to a more UK/US layout? That’s great to hear that you find it interesting (and cool to learn that it runs under WINE too)! 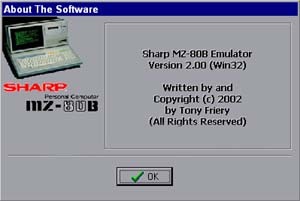 There’s definitely some strange stuff with the keyboard mapping – The Z/Y swap is to be expected as this would happen when you load a German edition of either CP/M or Sharp FDOS (where they would use a QWERTZ keyboard layout). This will all depend on the (OS) disk you’re running – some are German, some are not. The real issue, as a few people have pointed out, is the unusual keyboard mappings for the punctuation keys for example. These are mapped very similar to the original keyboard layout, and at the time I wasn’t sure how best to handle this – unfortunately they’re not configurable. Following a comment from a German Sharp-fan I’ve picked up the project again and am looking to rewrite it, but my spare time is limited these days so it may take a while. I’d expect the keyboard to be re-mappable in that future version, if and when it’s done! I’d also like to take a look at getting working Printer and Tape support too (I have some ideas now how to do that). So far the updated emulator is coming together – Part of the video core, all of the CPU core and some of the peripheral chips are complete. 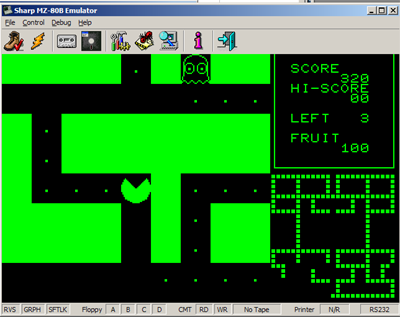 The video now runs more cycle-accurate (at 60Hz framerate) however the emulated board is not yet complete enough to even boot into the IPL ROM. I’ll post updated binaries (and eventually source) as it progresses into a meaningful state. I was wondering if the games Send 1, Man-Hunt and Land Escape are available on any of these disks? I tried downloading this emulator but couldn’t really make any sense of it. I didn’t even manage to load anything… but if these games are in the collection I’ll try figuring things out. Thanks for the interest though – this was my first computer so I understand the nostalgia! Thanks for the reply. 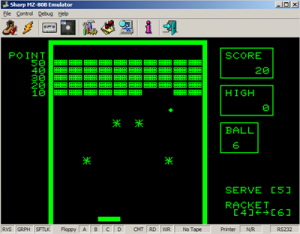 Yeah, these games were literally the first computer games I ever played (I would probably have played some arcade games earlier, but nothing that really stuck to the mind), so every few years I get the urge to experience them again. Heh, nostalgia would have been a lot easier if my first computer was a C64 instead! very interesting site! I acquired such a machine yesterday, along with the dual floppy drives, and some floppies as well. How did you create the img files of the floppies? Apologies for the massive delay Michael! I use cpdread usually (a tool designed for reading Amstrad CPC disks), although have had some success reading the raw data using 22disk in the past. The problem isn’t usually reading the disks but writing them. You may find that you have more success when using a 360k 5.25″ drive instead of a 1.2MB drive, as these are closer to the original hardware and have a chunkier and more forgiving head. 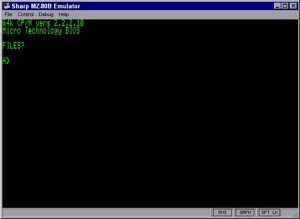 The other issue may be running such low-level tools on modern Windows systems – unfortunately I haven’t tried this recently so can’t really advise how to get around that (other than using an old Windows 98 machine where possible). 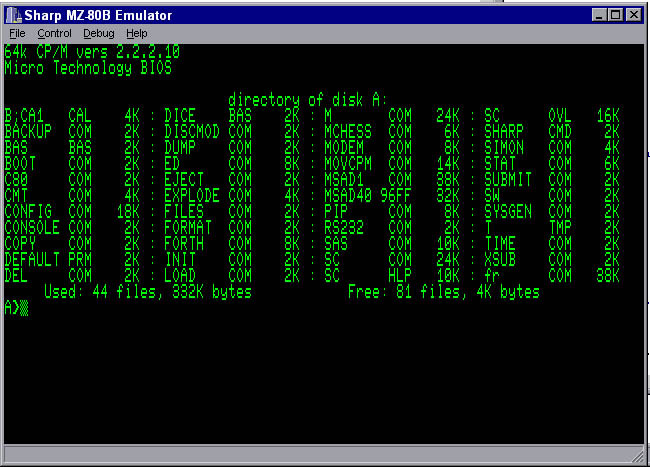 Would be possible to reverse back the DSK images to real floppies?